The Stich Ranch -- One of the most beautiful ranches in Southern Monterey County, the Stich Ranch is app. 1,371 acres of oak and pine studded property with a mix of terrain from level to gently rolling to steep. Once part of the historic Stewart Ranch, the property has been used for grazing and grain production in the past. The app. 1500 square foot 3 bedroom 1 bath residence was built in the early 1900's and has had a number remodels up to recent times. There are two wells on the property and numerous outbuildings including a small one bedroom 1 bath guest house. Located app. 17 miles north east of Paso Robles the property is at elevations from appx. 1400 to over 2400 feet above sea level. 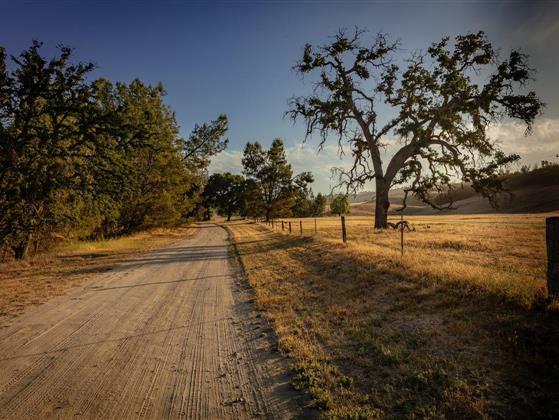 Stunning views of both Monterey and San Luis Obispo Counties can be had from the higher country with it's oak and pine groves, deep canyons and level open plateaus. Under Williamson Act Ag Preserve status, the property currently has property taxes of only appx. $2,000 per year.